The high school will be hosting an event open to the public on Tuesday evening, Sept. 25. Forest Grove High School is inviting community members to participate in an event it hopes will help improve the school and community's culture and outlook on others. Rachel's Challenge is focused on reducing violence by teaching empathy and kindness. It's a nonprofit organization started by the father of Rachel Scott, the first student shot in the 1999 Columbine High School shooting. The past two years, the high school has participated in a program called "Breaking Down the Walls," said junior student Siobhan Hayes, who is working to organize the Rachel's Challenge event. That program was introduced by administrators the year after students walked out of the school in protest when a banner with ''Build a Wall'' written on it was briefly hung in the school's commons by a student. The "Build a Wall" slogan refers to President Donald Trump's proposal to build a wall along the Mexican border, which supporters argue will be a deterrent to people trying to enter the United States illegally. The school year following the walkout, the atmosphere was "hostile and unwelcoming," Hayes said. 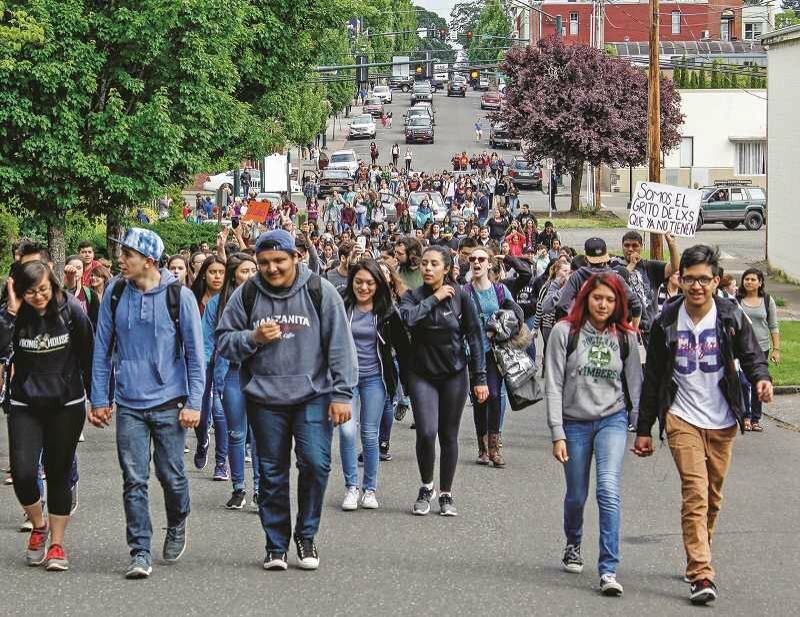 Fifty-five percent of Forest Grove High's student body is of Hispanic or Latino background, according to school district stats. The administration decided to look into something that might help fix the perceived negative climate, an effort that became Breaking Down the Walls. Now, the school is trying out Rachel's Challenge for the first time. It's a similar program but one that's more affordable for the school, Hayes said. While much of what the program is comprised of is unknown prior, Hayes said, it has been popular in schools nationwide since it began in 2001. She described it as "a place to create awareness about the way we treat others and (teach) empathy and just have an open discussion about how we treat others." There will be an assembly held during the day for all students on Tuesday, Sept. 25, and that evening the same assembly will be held for community members to attend. During the school year, there will also be three workshops held for 100 different students each time, chosen at random, to sustain the campaign's goals. "We are hoping that the high school can start affecting climate and change everywhere in our community," Hayes said. "And we just want to open that up (to the community) and encourage people to come because we want to see change everywhere. We want to see people being empathetic to each other. We don't want to feel like people are disenfranchised in our community. We want to be a whole." A historically diverse high school, the issues faced in the last several years aren't new, Hayes believes. "Forest Grove High School (has) just had a really bad culture," she said. "People felt like they were isolated. If you were of a minority, you didn't feel like you were part of the culture, so having a program in place that teaches people that we are all similar and that we have so many ways that we are the same and that we need to respect each other and show empathy (is important)." There are several reasons why minority groups within the high school have felt isolated, Hayes said. "I think that when we look at our admin and our teachers, we do not see a lot of representation," she said. "When we look at the amount of faculty that we have that speaks Spanish as a second language, we also see not a lot of representation. And then a huge problem in our district is, from the get-go, we have mostly Hispanic elementary schools and then mostly white schools, and so when they funnel into the high school, we have these two divided groups that went to school pretty much in different places." Hayes, like many students and faculty, is ready for change and to create a more welcoming climate across the school and community, she said. "We hope that (people) take away a way that they can apply empathy and a way that they can look at people and see them as more than just in a box," she said. "To see that we all have hardships, we are all going through things and we have to see each other as more than a title, we have to see each other as humans. And people that deserve respect and love." The evening event will be open to all community members Tuesday at 6:30 p.m. in the high school's auditorium. No sign-up is required.